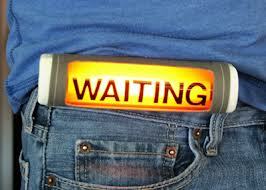 We as a church are in a period of waiting – just like Kevin talks of in his blog about how many people in the Bible waited for God. We are in the traditional period of Advent when we remember that we are waiting for Jesus, but we are also in a period of several months whilst we wait for our new minister to arrive. Not that I’m comparing Gill to Jesus – although I am sure she is most Christlike – but it struck me very much that this time of waiting is important. We can often see Advent as the time to get through before Christmas (and I think my children would impatiently fall into that category); do we see the next several months as a time to get through as a church before Gill comes and takes up her post as our minister? Or is it a time that is valuable in itself that we can use to find out what God is doing in us as a church during this time of waiting? During this time can we ‘wait expectantly, live hopefully, and serve faithfully’ to echo Kevin?